Local property developer Roxy-Pacific Holdings has announced their plans to develop a freehold residential plot along River Valley Road, which was acquired for only $110 million, into a brand new apartment building with more than 100 units and standing at least 18 storeys tall. Spreading across a relatively small land area of approximately 28,798 square feet (sq ft) – sitting right across Yong An Park condominium, the land price works out to be around $1,582 psf ppr, which includes an additional estimate of $17.6 million as development charges. Under the URA Master Plan 2014, the site has a plot ratio of 2.8 and is being zoned for residential usage. 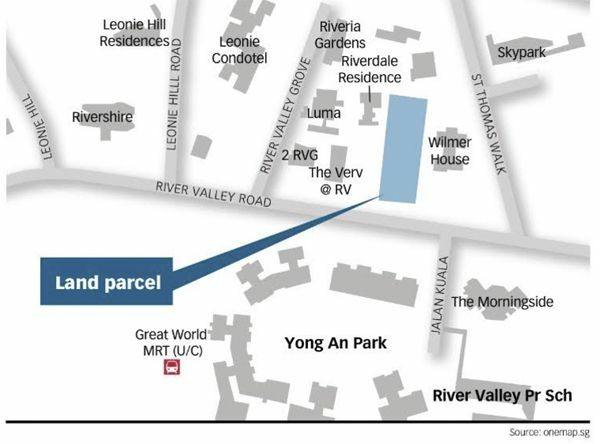 According to the broker for this deal, the site is strategically located just around 200 metres away from one of the exits for the upcoming Great World City MRT Station, located just at the junction of Leonie Hill Road and River Valley Road. With their experience in building small-to-medium sized property developments over the years, with the likes of Trilive at Kovan, Sunnyvale Residences, EON Shenton and LIV on Wilkie, Roxy-Pacific has mentioned that the unit mix for this future new launch project is still undergoing review and is likely to comprise mostly 2-bedroom and 3-bedroom unit types. They have added that freehold properties within the prime district of Singapore are seemingly undervalued – in view of the recently bullish bids of more than $1,000 psf ppr being placed for 99-year leasehold land tenders located outside the city centre. The group is, in fact, on the hunt for more freehold residential sites in the prime districts. Just last year, Roxy-Pacific took the larger stake in a joint-venture to acquire an old freehold development located at 120 Grange Road. They have also planned to redevelop that site in an 18-storey apartment with no less than 50 units. It was mentioned that subject new launch at River Valley is expected to be introduced in the 2nd half of 2018.